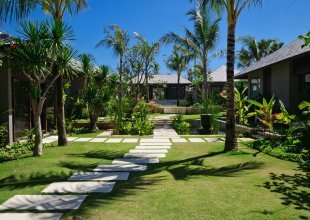 Villa Ambra exemplifies the paragon of luxury holiday in a location that is an inbred element of traditional Balinese rural life. 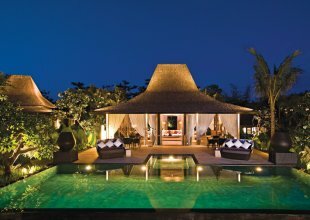 The villa has the best acclimatization for Bali’s fabled sunsets. On one side of it is the beach, on the other side is a river sanctuary, and inland are the beautiful rice fields. It is an apotheosis of restful and peaceful living. One can wake up to the sound of the surf, and forge ahead onto the balcony to experience the ever-shifting frontiers of an inlet lagoon as the sea meets the waves, etching through the sand and redefining its way with the changing of the tides. Guests can explore a plethora of relaxation areas, each one blessed with a spectacular view. Enjoy watching the fishermen working up the sea, watch the birds from a breezy verandah, or simply rest on a sun-lounger and allowing the wonderful staff to serve you great food and drinks. You can also intersperse with a few laps on the gleaming swimming pool and later gaze at a crimson sunset. An additional bonus is the private spa that offers a complete rejuvenation and high treatment. It is a paradise on earth.